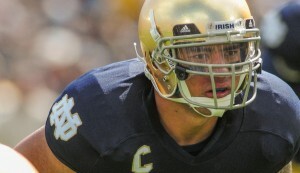 Te’o is the third defensive player to garner prestigious honor. New Haven, CT – University of Notre Dame senior inside linebacker Manti Te’o (Laie, HI) has been selected as the 2012 Walter Camp Player of the Year. Walter Camp Football Foundation President John Marks made the presentation tonight during ESPN’s 6 p.m. edition of SportsCenter. The Walter Camp Player of the Year is voted on by the nation’s 124 Football Bowl Subdivision head coaches and sports information directors. Other finalists for the Walter Camp 2012 Player of the Year award included Texas A&M quarterback Johnny Manziel, Kansas State quarterback Collin Klein, USC wide receiver Marqise Lee and Oregon running back Kenjon Barner. The 46th recipient of the Walter Camp Player of the Year award, Te’o is the third defensive player to earn the honor. Former Pittsburgh defensive end Hugh Green (1980) and Michigan defensive back Charles Woodson (1997) each won the award. Te’o is also the fourth Notre Dame player – tight end Ken MacAfee (1977), wide receiver Tim Brown (1987) and wide receiver Raghib Ismail (1990) – to be selected Player of the Year. The 6-foot 2, 255-pound Te’o is a Walter Camp First Team All-America selection after leading the Fighting Irish defensive unit that ranks first in the nation in scoring defense (10.3 points allowed per game) and sixth in total defense (286.8 yards allowed per game). Through 12 games this season, Te’o has totaled a team-best 103 tackles (8.6 tackles per game) and is tied for third in the nation with seven interceptions. Te’o has played a role in 11 of Notre Dame’s 23 turnovers this year (7 interceptions, 2 fumble recoveries and 2 pass hurries that directly led to interceptions). Top-ranked Notre Dame (12-0) will play second-ranked Alabama (12-1) in the BCS National Championship Game on January 7. Te’o has appeared in 50 career games and amassed 427 tackles (209 solo). He is thesecond Notre Dame player – joining two-time Walter Camp All-American linebacker Bob Crable – to register at least 100 tackles in three consecutive seasons. A graphic design major, Te’o has a 3.32 cumulative grade point average and is scheduled to graduate this month. Te’o, along with members of the Walter Camp 2012 All-America team, will be honored at the organization’s national awards banquet on Saturday, January 12, 2013 at the Yale University Commons in New Haven.